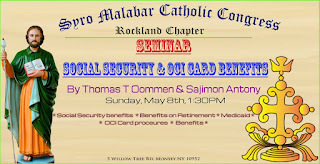 Please consider this email as an invitation letter to the "Social Security and OCI card benefits seminar" . 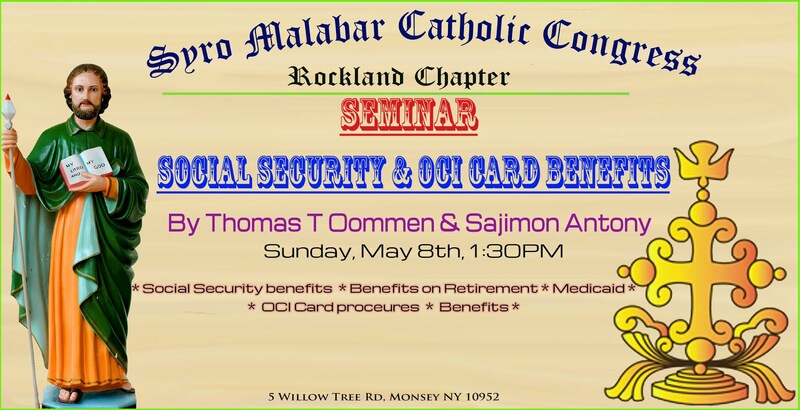 Take this opportunity to improve your knowledge about Social security benefits and OCI card process&benefits. 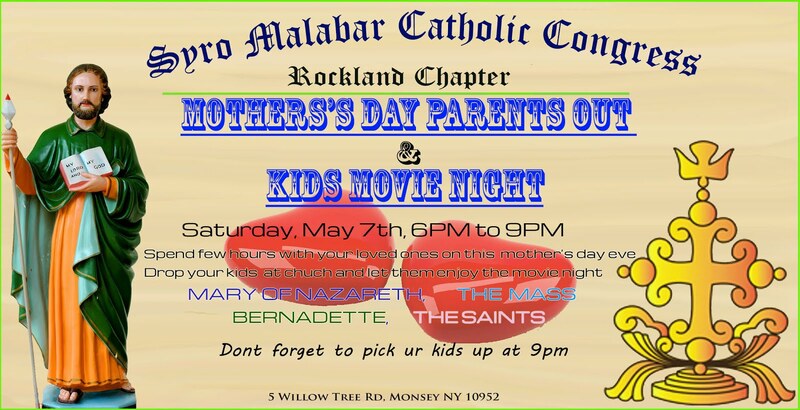 I hereby give permission to my above named child to participate in all activities of "Parent night out and kid's movie night". Get important updates from our church in a timely way. By texting SMCCR to 84576 from your phone . We are sad to announce that our church member Varghese Panthapattu's father Philipose Varghese Panthapattu (91 y/o) passed away today (4/17/16) at Thottakara, near Changanacherry, Kerala. We extend our heartfelt condolences and prayers to the sorrowing family. Varghese is going to Kerala for the funeral tomorrow. There will be a prayer at his residence today at 4.30 PM. Little Angels Choir practice is scheduled on 4/29/16 Friday (after mass) at 6.30 PM. Our piano teacher Angela Argenzio will teach songs. Please mark your calendar and be prompt for the practice. 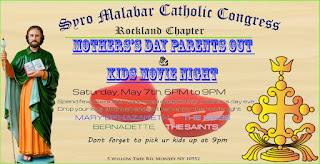 Little Angels will be singing the choir for the First Communion mass on May 14 (Saturday). Raju Kadumthottu's mother Thressiamma Kadumthottu (82) died in Kerala near Changanacherry on 04/12/16 at 4 AM. Funeral will be held at St. Joseph Church, Veroor on Saturday. Raju and his family will be going to Kerala tomorrow. On behalf of the Syro-Malabar community in Rockland, we extend our prayers and condolences to Raju, Susan, Ashley and Amanda for their loss. Let us pray for the departed soul and for the sorrowing family. Just a reminder, Bishop appeals are on the way. Please return the envelops with your generous contribution on or before May 1st Sunday. Please try to donate at least 100 dollars per family. The following is the info about the upcoming trip to Haiti. Please contact Florence THOMAS at 8453230709 if the Spirit inspires you to join this life changing mission trip. This is the email with the information about the Haiti trip! It would be great if you could send the email out to the parish soon so that people have a couple of days to think about whether or not they would like to go on the trip! Last year's trip to Cap-Haïtien, Haiti was an eye-opening and rewarding experience. This year, we are planning a similar trip to Port-au-Prince, Haiti to volunteer at the orphanage of the Missionaries of the Poor. This orphanage houses about 90 physically and/or mentally disabled kids whom we will be serving, attending to, and spending time with. Flight tickets are ranging between $650-850. The plan is to leave July 5th and return July 13th. Housing will not be at the missionary compound, but rather at St. Joseph's seminary run by the Scalabrini fathers. It is about 5-10 minutes away from the MOP orphanage. Tickets are only going to get more expensive, so please email:17jacobc@gmail.com ASAP. If you have any questions or would like more information, feel free to email the above address. Please let us know by Thursday, April 7th 2016 AT THE LATEST if you do plan to come. Sorry for the short notice. P.S. If anyone would like to purchase a ticket on his or her own, please feel free to do so. Tickets prices fluctuate so you may be able to find cheaper tickets. However we must arrive in Haiti and depart the same day as not to cause any inconvenience to the brothers.